Although broken, this unfluted Folsom or Midland point is an especially nice example. It has fine delicate ears and tiny micro flaking along the edges. Points like this are referred to as either unfluted Folsom or Midland points. Some archaeologists believe they are either a variant of the Folsom point or just a Folsom point that was not fluted. Some of these points have a fluting platform on the center of the base that was never used. The reason for this might be that they were to thin to flute. Its also been suggested that the platform may have become a residual design feature from traditional Folsom point production. Notice that this point does have a slightly raised area in the center of the base that might relate to this description. Midland points were named in 1955 by Fred Wendorf, Alex D. Krieger and C. C. Albritton from examples found on the Scharbauer site near Midland, Texas. This point was found in eastern Wyoming at Goshen Hole on the high Plains where the land is described as a deep depression. 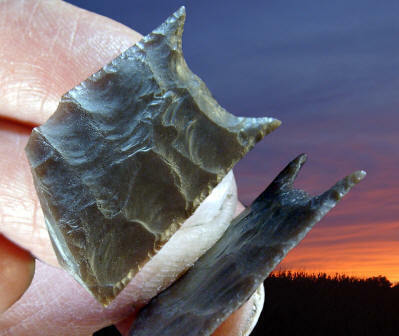 This point is made of a semi-translucent dark brown material that is similar in appearance to Knife River flint. It measures 1 1/4 inches (3.2 cm) long.